Tonight is the premiere of MasterChef Junior Season 4 (8/7c on FOX)! I've watched the previous seasons, and each season I'm blown away by how talented the young chefs are! If you have young chefs in your home, I'm sure they'd love the MasterChef Junior Inspired Cooking Set. Nadia's kids loved the set, and I'm sure any budding chef would! You can enter below to win a set for an aspiring chef, and don't forget to catch tonight's premiere of MasterChef Junior! 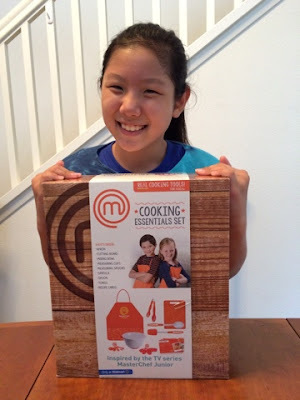 Win: One lucky winner will receive a MasterChef Junior Inspired Cooking Set! The deadline for entries is November 20, 2015 11:59pm HST. If you submitted an eligible entry and it is chosen by random.org as the winner, you will be notified via email on or about November 21, 2015 (make sure your email address is in your profile or comment and be sure to check your junk/spam, etc. folders) and will have 3 days to respond.